Home > Moral Issues > Why is British Veal a More Ethical Choice? There are many strong views about veal - vegans think that any veal is deplorable, while omnivores in the Netherlands love it. In the UK there has been a lean towards more ethically produced veal in recent years, with the latest involvement of celebrity chefs helping the campaign to gain momentum. Veal has never been a particularly popular meat in the average UK shopping basket, accounting for only 0.1 % of all meat bought here, with only 1 in 100 households ever buying it at all. With chicken and beef currently in the news with exposés of dodgy production methods, factory farming and meaningless quality assurances, some consumers are starting to look into other more ethical possibilities and, perhaps surprisingly, veal is coming up smelling of roses. In fact, it is the 'rosé' veal, produced in the UK that is helping this previously unfashionable meat gain a bit of good press. Highly respected TV chefs such as Hugh Fernley-Whittingstall and Sophie Grigson are lending their support and consumer influencing power to support this, with the introduction of the Good Veal campaign. The Good Veal was started in 2006, but has only gained momentum in the last year. 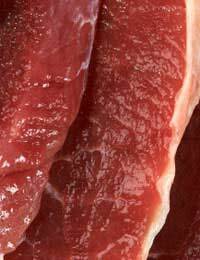 It focuses on 'rosé' veal, so called because it has a pinkish hue to the meat. This colour of the meat is a visual representation of the ethical production methods as the white, or milk-fed veal that is so controversial is so much paler in comparison. Veal is meat from young calves, usually slaughtered at only six months old. They are always male calves, as the females are useful as milking cows. The reason people have traditionally disagreed with veal production is that this is a very young age for the calves to separated, with the slaughter methods often considered inhumane and against animal rights. However, supporters of veal say that, if the calves are not slaughtered in the UK, where we now have stricter guidelines that are getting stricter all the time, they are sent to other countries where they will be even less well looked after and slaughtered more painfully. This is not even taking into consideration the stress and pain of the transportation. Why is British Veal More Ethical? With 'rosé' veal there are tight rules and regulations that ensure the young male calves are humanly slaughtered, following the suggestions made by DEFRA (Department of the Environment, Food and Rural Affairs in January 2008. The promotion of the high welfare 'rosé' veal is to encourage shoppers to buy and cook this meat. The RSPCA has also approved this British veal and is has the Freedom Food stamp, a quality mark that Hugh Fernley-Whittingstall is passionate about. The supermarkets have picked up on the rising popularity of ethically produces, high welfare British veal, with consumers enjoying the subtle taste, lower fat meat. Marks and Spencer and Waitrose are already only stocking British 'rosé' veal, with Tesco phasing out their non-British veal across their stores.